In one simple step, you’re able to add one user to multiple blogs. You bulk add a user to multiple blogs using the Bulk Actions drop down menu on your My Sites page. Please refer to the add new teacher support page if you are using My Class and need to add another teacher to all student blogs. 2. Select ‘Assign the user to selected blogs‘ from the ‘Chose Action’ dropdown menu. 3. Add the person’s username or the email address attached to their existing username. They must already have an existing username. If the user doesn’t exist you need to first create their username. 5. Select the check boxes under the blogs you want to add your new user to. 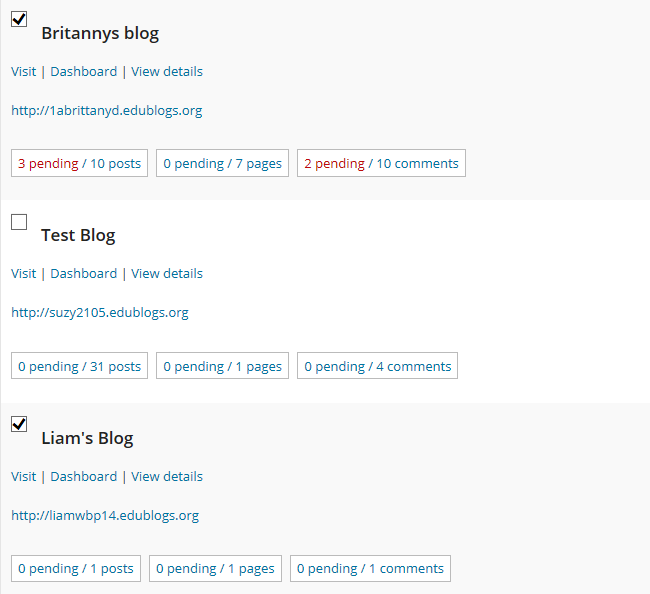 You’ll only see the checkbox under blogs you are attached to as an admin or teacher user .